The first thing to know about tuning ukuleles is that not all ukuleles are tuned the same way. If you have a soprano, concert or tenor ukulele, you’ll be using the same tuning method called GCEA tuning. However, if your ukulele is a baritone, you’ll be using another style of tuning called DGBE tuning. To get started tuning any kind of ukulele though, the first thing you’re going to need to do is familiarize yourself with your uke. Hold your ukulele in front of you, either up at your chest or down lower if it helps you to see the strings better for tuning. Make sure the neck is pointing to your left. First, is the headstock. This is the the top of your ukuleles neck, the part that is pointing left when you hold it in front of you. Second is the neck itself. This is where the strings run down and where the frets are placed to help you keep track of notes when you’re playing ukulele chords. Next are the strings. Looking down from top to bottom is how you’ll read your strings when you’re tuning them. For example, if you have a baritone ukulele, your top string is D, the second string is G, the third string is B and the fourth and bottom string is E.
Last, you should note your tuning pegs. These are the metal windy things that you’ll use to adjust your strings during tuning. The string that is attached to each peg is the one that peg is in control of. To lower the pitch of the string attached to each individual peg, you’ll loosen the peg and to make the pitch of that string higher you’ll need to tighten that tuning peg. So, as mentioned before, to tune your soprano, concert or tenor ukulele you’re going to use the tuning of GCEA which is the standard tuning of ukuleles otherwise known as C6 reentrant tuning. Whoooa! What is “reentrant tuning”? You know how if you drag your fingers across a piano from one end to the other it either goes from super low-pitch to super high-pitch or the other way around, depending on the direction? Reentrant tuning means that your instrument isn’t going to follow a progression in the pitch. One string might be higher pitched than the one above it and then the one after it might be lower pitched. So, reentrant tuning means that instead of the pitch of your strings ascending or descending in proper order from the highest pitch to the lowest pitch like the white keys do on a piano, they’re kind of going back and forth which makes for a rich and complex sound when you strum your uke. Now, there’s more than one way to tune your ukulele to GCEA tuning, whether you do it with an online tuner, by ear or using a tuning device, and which method you use is simply a matter of preference. Still, some methods are universally easier than others. For most people, the easiest way to tune a ukulele is with a digital tuner. By the way if you have a baritone ukulele, all of these apply but just note that baritone ukuleles are tuned to DGBE tuning. 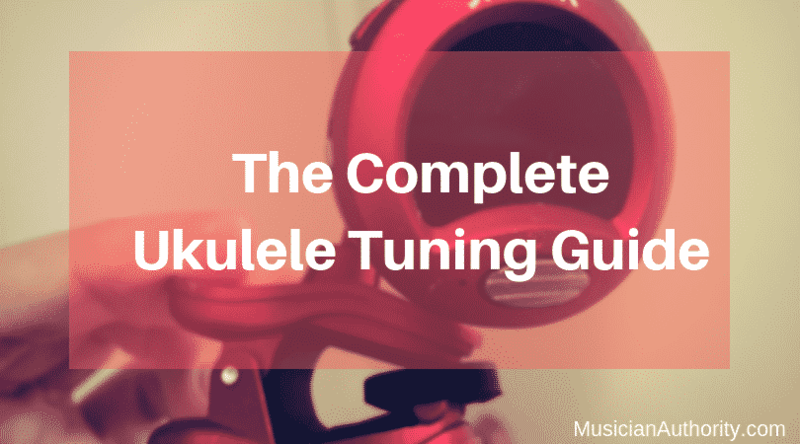 If you have a baritone ukulele, skip on down past this section but if you own a soprano, concert or tenor ukulele then this is the spot to learn about tuning your uke with a digital tuner. The most common way to tune a ukulele is with a clip-on tuner. Sometimes these are called digital tuners, but honestly, apart from brand and design differences, these are essentially the same – a clip on tuner with a digital face that indicates when you’ve reached the right pitch for each string. This can be used with any ukulele, but make sure if you’re using a baritone to use its tuning. Clip the tuner on the headstock. Now, hold your ukulele in front of you with the strings faced out and the neck pointed to your left, like you’re all ready to play. Gently strum or pluck the G string just once. This is the top string, the one that is closest to you. When you do this you’re sending vibrations up to the tuner, allowing it to read where you’re at pitch-wise and whether you need to tune that string up for a higher pitch or down for a lower pitch. Most digital tuners will tell you which note your string is playing at. If it’s not the one that you want it to be then you will know that that string needs to be tuned. So if you’re tuning your G string then you want the tuner to read “G”. Continue to pluck your string and adjust accordingly until you reach G on the tuner. The tighter your string gets, the higher the pitch is getting. Likewise, the looser your string gets, the lower the pitch. Remember, to tighten this string you’ll turn the peg away from your body and to loosen this string you’ll turn the peg towards you. Now that you’ve tuned your G string, you’re on to the one right below it, your C string. Follow the same steps you just did, but instead just tune to C. Again, to tighten this particular string you’ll turn the peg away from you and to loosen it you’ll want to turn the peg towards you. Halfway there! Third string down is the E string. The only difference here is that to tighten this string you’re going to turn the peg towards you this time and to loosen this string you’ll turn the peg away from you. Now you’re on your last string, the bottom string which is your A string. As you tune this string you’ll notice that it’s going to have a higher pitch than the string you just tuned. That’s the reentrant tuning we learned about. As with your E string, you’re going to turn the peg towards you to tighten and away from you to loosen. Another easy way to tune your uke on the go is to use a tuning app. To find one, use your phone’s app store to search for ukulele tuning apps. Read the reviews and choose one that others find accurate and simple to navigate. Some will be free and some you’ll have to pay for. Tuning apps work best in a quiet room since they utilize your phone’s built-in microphone to measure the sound of your ukulele strings. Open the app by tapping the app’s icon on your phone. Set your phone down nearby to where you’re playing, preferably on a flat, even surface. If the app gives you the option, choose which standard of tuning you’ll be using. Remember, if you own a soprano, concert or tenor ukulele you’ll be tuning to GCEA with the top string tuned to G, the next one tuned to C, the third one tuned to E and the last one tuned to A. If you have a baritone ukulele, you’ll choose DGBE tuning with the top string tuned to D, the next string tuned to G, the third string tuned to B and the last string tuned to E. So, even if your particular app doesn’t give you the option to choose which tuning standard to use, you can just go through each string and tune it depending on which type of ukulele you’re using. Hold your ukulele with the neck pointing to your left and pluck the top string. If you have a baritone ukulele this is your D string. If you have any other kind of ukulele this is your G string. See what your app is reading the string as. Adjust your string using the connected peg. To give your string a higher pitch you must tighten it. To give your string a lower pitch you must loosen it. Pluck the string again and see what pitch the app is reading your string at. Continue plucking and adjusting until your top string is reading as the pitch you want it to. Follow this same process for each string, working your way to the bottom, last string. Give your uke a final strum to make sure things sound pretty! If you have your computer pulled out, an easy way to tune your ukulele is with an online ukulele tuner. An even easier way to do this is to search for a tuner that accommodates your specific ukulele. So if you want to tune your baritone uke search for “online baritone ukulele tuner” or if you’re tuning a standard ukulele (soprano, concert or tenor) then search for that and you’ll find a bunch of results. Try to find a tuner that when you press the tuning button, the sound continues until you turn it off. That way as you’re tuning your strings you don’t have to stop and turn the tuner back on. Most online tuners will have you tune by ear. To do this you will begin by clicking on the tuner of the first string on the online tuner. This allows you to hear what the string will sound like once it’s in tune. For simplicity’s sake you should start with your top string and work your way down. Start by holding your ukulele in front of you with the neck to your left. Note where each string is located by running your finger from each peg to the string attached to it. If you are tuning a baritone ukulele then from top to bottom, the strings are D, G, B and E. If you’re tuning any other kind of ukulele then, from top to bottom, your strings are G, C, E and A. After listening to the tone of the top string’s correct tuning on the online tuner, pluck your own top string. If it sounds lower than the online tuner’s version then you should tune up to a higher pitch. Turn the peg that’s attached to your top string away from you to tighten to a higher pitch and turn it towards you to loosen it to a lower pitch. Continue to pluck the top string along with the online tuner and adjust with the tuning peg until you can hear that the pitches are now in sync. You’ll know that your string is in tune when it sounds just like the one being played on the computer. Follow the same process with your second string. When you move to your third and fourth strings you’ll do the same thing, you’ll just turn those tuning pegs away from you to loosen the string (lower the pitch) and towards you to tighten it (make the pitch higher). Tuning your ukulele by ear is a bit more complicated than just using a designated tuning device and this method isn’t ideal if you’re playing along with other musicians, since you’ll want to be in tune with them as well. The easiest way to tune a ukulele by ear (also known as tuning it to itself) is to use relative tuning. That means you’re assuming that one of the strings is in tune. Hold your ukulele with the strings facing out and the neck pointed to your left. Look down and note that from top to bottom, your strings are G, C, E and A. Place a finger on the E string. If you’re looking down at your uke this is the string above the bottom string. Now, take note of the frets along the neck. Counting from the top of the neck down, slide the E string finger just above the fifth fret. Holding your finger down play the E string and then play the string below it (the A string). Do they sound the same? If they don’t you’ll need to tune your E string to sound like the A string. Keep your finger held down above the fifth fret on the E string and adjust it using the tuning peg. If the string sounded higher than your A string then you should loosen it by turning the peg away from you. If the E string sounded like it was lower than the A string then you should tighten it by turning the peg towards you. Pluck the E string again, keeping your finger held down above that fifth fret and then pluck the A string. Compare the sound once again. Do you still need to do some adjusting? Continue to adjust the tuning peg until your E string sounds the same with your finger pressed down above the fifth fret as the A string sounds when you play it open. Once they match, your E string is in tune. Next you’ll tune the C string. The C string is the second string from the top. Place a finger on it and slide it down to just above the fourth fret this time. Remember, you’re going to count from the top of the neck down. Press your finger down once it’s just above the fourth fret and pluck the C string. Do they match? If they don’t, adjust your C string, still holding it down above the fourth fret, until it matches the pitch of the open E string. Last, you’ll tune your G string, the top string of your ukulele by placing your finger on it and sliding it just to above the second fret. Press your finger down above the second fret on the G string and give it a strum. Strum your open C string, the one below that you just tuned. If the G strings pitch doesn’t match the pitch of the open C string then it’s time to tune just like you did with the last two strings! How about tuning by ear with a Piano? Find the middle C key on your piano or keyboard. If you’re not sure where this is located look for a diagram online. Now, find the G, E and A keys that are nearest to the middle C key. Again, if you’re not sure where these are located you can pull up diagrams online. Hold your ukulele in front of you with the neck pointed to your left and pluck the top string, the G string. We’ll tune in order from top string down. Now, tap the G key that you located earlier. Your G string should match the pitch of the G key on the piano. If it doesn’t, tune it by adjusting the tuning peg connected to your G string. To make the pitch of this string higher, turn the peg away from you. To make the pitch lower, turn the peg towards you. Pluck the string again and check it against the pitch of the G key on your piano. Continue to adjust the string until the G string and G key match. Now, pluck the next string. This is your C string. Tap the C key that you located earlier on the piano. Follow the same process that you did before but this time, just make sure that your C string and C key match. The third string down is your E string. Pluck this string and the E key on your piano and compare the difference. Tune the E string the same way that you tuned your other two strings, but instead turn the string towards you to tighten it (make the pitch higher) and turn the peg away from you to loosen the string (lower the pitch). Last is your A string. Using the A key on your piano you’ll follow the same process as before, turning your peg towards you to make the pitch higher and away from you to make the pitch lower. When it comes to learning how to play ukulele, one of the first things you should learn how to do is to properly tune it. Hopefully you’ve found a method or two in this guide that works for you so you can strum on with confidence and enjoy your uke!